Much of the hype around the genome editing tool known as CRISPR focuses on its potential to cure genetic diseases. But our bodies need more than a healthy genome to survive and thrive—they also need food, and that’s where we may see CRISPR’s earliest effects on our lives. “When I think about where we are likely to see the biggest impacts in the shortest amount of time, I really think it’s going to be in agriculture,” CRISPR co-discoverer Jennifer Doudna of UC Berkeley told WIRED last week. In this episode of Base Pairs, we talk with plant scientist and Associate Professor Zach Lippman about the threats that climate change poses to agriculture, and how CRISPR could help overcome them. He tells us how a genetic tweak that his team made in tomatoes allows more flexibility in where we can grow crops, and why the new tool was critical in this achievement. We also talk about where CRISPR fits into the conversation on GMOs. BS: Hey everyone! I’m Brian. AA: I’m Andrea, and this is Base Pairs. BS: Exactly one year ago, we launched this show about the power of genetic information. And now, NBC might be making a show about the power of genetic information, too. AA: Except theirs would be a TV show instead of a podcast. Oh, and instead of being produced by Brian, the NBC show would be produced by Jennifer Lopez. BS: Yes, that Jennifer Lopez. The pop star. This show that NBC’s considering would be called C.R.I.S.P.R., a name that comes from a real scientific tool that few scientists would dispute is the biggest thing that’s happened in biology in the last few years. CRISPR makes it easier than ever to edit the genetic “letters” of DNA. BS: It sounds pretty farfetched for the sake of drama. But, if done very thoughtfully, who knows—it could be a good way to get more people thinking about this new technology. AA: And CRISPR is dramatically changing biological research. Quite a few scientists at CSHL and many more around the world are using CRISPR for their experiments, for example finding new ways to kill cancer. BS: Eradicating diseases is probably the most obvious use of CRISPR, and scientists have been quick to adopt it in their research toward that goal. Of course, disease isn’t the only big obstacle that humanity faces. ZL: With the change in climate that’s happening, whether you believe it’s human-created or not, there is a change that’s going on, you now have to start to consider whether we’re gonna need to expand even further the range of where we’re able to grow our crops. — Now we have a tool to match that urgency because of how quick and powerful the gene-editing tool that comes from CRISPR is. BS: That’s Professor Zach Lippman. He’s a plant scientist who’s using CRISPR in a way that could help us overcome the challenges that climate change poses to crops. AA: NASA is actually doing a lot of work to help better understand those challenges, using their satellites and other technologies to gather information from all over the world. Cynthia Rosenzweig, a senior research scientist at NASA, explains in an educational video that climate change will affect different places in very different ways. VIDEO: Vulnerability to climate is uneven across the world. Agricultural studies show that in the mid and high latitudes, the agriculture there should actually be ok for at least a while, before the really big temperature changes set in. But in the low latitudes, where it’s hot already and where there are more arid areas, climate change will affect those agricultural systems negatively right from the beginning. ZL: You can imagine a scenario in the future where areas where we currently grown our major crops, for example in the corn belt, could become too hot and too dry as temperatures rise and those high temperatures move further north during the peak of growing seasons. So in areas like Canada, where you have northern latitudes, you would have an opportunity to grow crops in areas now where the temperatures are more moderate—similar to the temperatures we have right now for example in the middle of the country. AA: I talked to Zach about his lab’s recent discovery in tomatoes, and how it shows CRISPR’s incredible potential to help keep these climate shifts from harming our food supply. Zach mostly works with tomatoes for his research, and while his love for agriculture was clear early on, this is a pretty strange turn for his life to have taken. ZL: So, I grew up on the coast of Connecticut and worked on a vegetable farm, only job I could get when I was 13 years old. Got paid cash under the table every two weeks and was obviously around a lot of different plants, crops. And ironically the one that I despised was tomato. And the reason that I didn’t like it was that you would have to harvest it from staked plants, and you would see this beautiful red tomato on the front and you’d go to the back and you’d grab it and it would be rotten and it’d go squish. BS: Despised, wow, that’s a strong word. He must have found some redeeming quality that helped him get past the squish issue. AA: I was surprised too. But then he explained that there’s something special about the way tomatoes produce flowers. ZL: I was still very interested in the plant itself, because it was one of those few plants that continued to put out new flowers and fruits throughout the course of its growth and during the season. AA: It wasn’t the tomatoes themselves that captured Zach’s interests, it was the flowers: these beautiful, delicate structures that we so heavily depend on for our food supply. BS: Yeah, flower power isn’t just a catchy anti-war slogan. Flowers have a huge influence on our lives because they’re essential to so many of the fruits and vegetables we eat. ZL: The reason we focus on tomato is because it’s one of those plant systems, those plants that we call model systems that are representative of many other crops. — It’s a representative of pepper and eggplant and soybean—so all these crops that produce flowers and then bear fruits. AA: While Zach was telling me about how much our food depends on flowers, I thought about how a few years ago, my family wanted to go apple picking, like we do every year, but when we called the orchard they said they hardly had any apples. In the spring, a late frost wiped out almost all of the flowers on the apple trees, which meant no apples in the fall. BS: It’s amazing that farmers are able to produce crops so consistently, considering how delicate flowers are. AA: It is. Plant breeders have worked for decades to create crops that can pretty reliably withstand the weather in a particular place. The weather has always changed from day to day, but you could expect the same general patterns from year to year. ZL: With climate change, all of that — “stability” — for a particular environment that is quote-unquote “not changing very much” over the last century very much, but now is, now gets thrown up in the air. BS: Stability for a particular environment used to be enough, but now that the climate is changing, we need flexibility so that we can move crops to new environments. AA: Right, and to achieve that flexibility, scientists like Zach first need to understand the constraints on where crops can grow successfully. Have you ever wondered how plants know when to bloom? For a lot of plants, the number of hours of light in a day is a critical cue. BS: So for a lot of plants, you can’t just expect them to flower properly when you move them far away because days are different lengths in different parts of the world. ZL: Wild tomato originated in Central and South America, where it’s near the equator, so it’s not exactly a short day, not exactly a long day, but it turns out that many of the wild tomato species, the wild tomato relatives, flower best under shorter day conditions. AA: If you try to plant one of those wild tomato species much farther north, where the summer days are longer than in places near the equator, they flower really late in the season and don’t make many tomatoes. BS: Some tomatoes grow just fine all the way up here in New York, though. My family would grow them in our garden all the time. AA: That’s the thing. Unlike those wild tomatoes from equatorial regions, the domesticated tomatoes that we usually grow and eat here in the U.S. went through a genetic change that allowed them to grow far beyond the geographic range they were first adapted to. ZL: This change caused the tomato plant to no longer care about day length and it essentially became day-neutral. — This is the reason that we can grow tomatoes in much higher northern latitudes. AA: Zach really wanted to find out what that change was. BS: But if we already have tomatoes that don’t care about day length any more, why bother? AA: That was enough to make tomatoes grow well here in the United States, but with a changing climate and a growing population, we need even more flexibility. ZL: Now the question is, can we develop varieties that can grow at even further northern latitudes where you have two things working against you. One is you have an even longer summer day length and the total number of days in the summer is now shorter, so you have to put out your flowers and your fruits and your yield under a very long summer day, in terms of hours of light, and under a very short window of time. BS: Long days and a short summer. So even if the tomato plants can flower with long days, they’ll have fewer days to go through the full process of developing their fruits. They need a head start. BS: So Zach wants to turn that genetic dial. That sounds like a job for CRISPR—I think. What exactly is CRISPR, anyway? AA: Scientists like Zach call what CRISPR does “gene editing,” because it makes it possible to create genetic changes in genes. And it allows them to make those changes much more precisely than ever before. BS: Initially, plant breeders just had to wait until they got lucky, and nature happened to create the genetic mutations they were looking for. Then, scientists figured out how get “nature’s genetic engineer”—a common species of soil bacterium—to work for them. But the bacteria still had their own agenda, so scientists didn’t have full control over the changes they made. AA: Now, the big difference with CRISPR is that the plant scientists are the engineers and can control exactly which letters they want to change. BS: Zach isn’t exaggerating the amount of time it takes to do this work using what people think of as natural or conventional breeding. Remember Dave Jackson from episode 4, “The People Problem”? He was looking for a mutation in a gene that would lead to a big increase in corn’s yield. And it took a while. BS: Dave is very modest, but finding that yield-boosting mutation even after 20 years was a huge accomplishment. It took an incredible amount of work, and quite a bit of luck. AA: But like Zach, Dave started using CRISPR in his research once it became available because it makes this process way, way faster. ZL: Within 8 months you would be able to induce a mutation in that gene and then have the ability to ask how it affected that plant. BS: 20 years to 8 months. And it’s that easy? I must be missing something. How does CRISPR know where to make a mutation? I’ve heard it described as “molecular scissors” before, but there has to be something guiding the scissors to the right spot. AA: There is. CRISPR is really a two-part system. The “molecular scissors,” which is really a specialized protein, is one part. The other part is a piece of RNA, an essential molecule in cells that’s very similar to DNA and can bind to particular pieces of DNA through base pairing. BS: Like how the As and Ts or Cs and Gs in DNA pair with each other. That’s how the two strands of the double helix stay together—they have complementary “letters,” or bases, that attract each other. AA: Right. RNA can do essentially the same thing. A piece of RNA will bind to a piece of DNA with the complementary sequence. The protein “scissors” use a piece of RNA that’s complementary to the DNA of interest to guide it to the right spot. BS: Ah, because that RNA will be naturally attracted to that exact piece of DNA. That still sounds too simple. AA: Ok, then maybe hearing from one of the CRISPR co-creators herself will help convince you. UC Berkeley Professor Jennifer Doudna was here at CSHL for a big meeting in 2015 and she sat down for an interview with former Banbury Center Director Jan Witkowski. It was the summer, so they took advantage of the warm weather and did the interview at a gazebo on campus that overlooks the harbor. JD: This protein will actually find its RNA out of all the RNAs in the cell, will bind to its guide, and then use that for recognition of DNA and making the cut. JD: This is the amazing thing, it really is. You know, I mean in my lab some of the early experiments that we did testing this in mammalian cells were done by a first-year graduate student. BS: Wow, I’ve never heard genetic engineering sound so easygoing. The birds chirping definitely add to the effect, but the fact that a novice scientist was able to do this work shows that it’s relatively easy to learn how to use CRISPR. AA: All of a sudden Zach basically had the tool of his dreams available to adjust the genetic control dial for flowering, which he’s been interested in since he was a kid. BS: And scientists had already made some progress on figuring out what those dials are. It was just so laborious to test that idea out using older tools—to turn the dial the way you wanted. ZL: The plant has this — yin-yang relationship between these hormone proteins. BS: Hmmm, kind of like a dial. 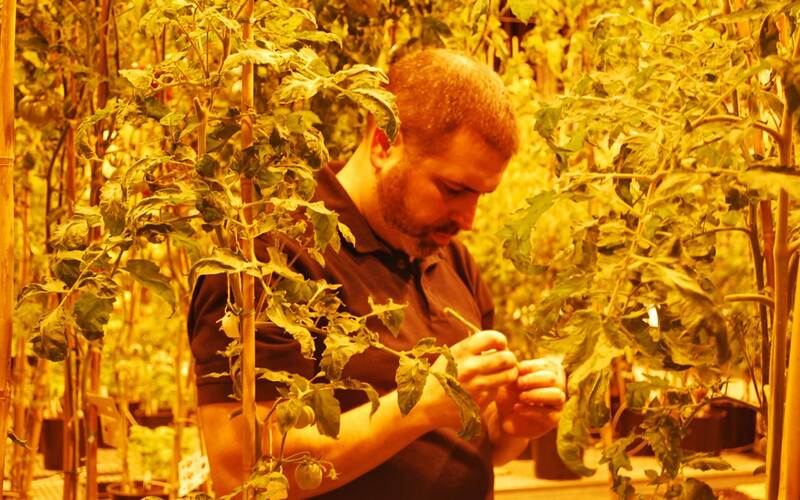 AA: Sure enough, when Zach compared the genomes of wild and domesticated tomato species, he found some very intriguing differences in a gene that controls the production of the anti-flowering protein. And the wild plants made even more of the anti-flowering protein when exposed to long days than they did for short days. BS: Which suggests that the amount of this anti-flowering protein the plant produces has something to do with its sensitivity to day length, since the wild tomatoes pay attention to it and the domesticated ones don’t. AA: And now that CRISPR is available, Zach could precisely target the gene that seemed to be behind that difference. ZL: A lot of what we found is that the system is tunable, so that you can tune the relative yin versus the yang. ZL: Now they’re putting out their flowers, fruits, and yield much faster (AA: Two weeks faster!) and so the possibility of expanding cultivation to northern latitudes for example in Canada, where it’s very difficult to grow many of the modern elite hybrids that dominate the tomato production industry, now we can start to think about modifying the genes — to grow them in regions like Canada where you have very long days and very short summers. BS: That’s amazing! It’s like, instead of trying to precisely turn a tiny dial using a cumbersome 30-foot pole, scientists can just reach right out and grab it. AA: Right, he’s working on making changes to some of the same genes that breeders have been changing through conventional breeding for a very long time, but CRISPR is greatly speeding up the process. BS: Plus, like Zach was saying earlier, tomatoes are a representative of a huge variety of plants that flower and bear fruits. So maybe he can turn this same genetic dial in other crops. ZL: It will be an interesting question in the future, how tunable the system will be, not only in tomato but in other crops where again we have conservation of genes between many different plants, the same flowering genes, the flower-promoting genes and the flower-repressing genes that exist in tomato also exist in rice and corn in the same gene families, many of them do the same functions. AA: The hope is that this will help provide growers and breeders with a genetic toolkit to tweak the flowering time of a crop in a single generation, instead of the many, many generations that breeders had to go through before. BS: There is an elephant in the room, though. Are these early flowering and fruiting tomatoes GMOs? AA: Bizarrely, even though CRISPR technology itself is relatively straightforward, this question of whether the final products—like Zach’s early tomatoes—are GMO is a little more complicated. ZL: From a technical standpoint, they are no longer GMO and they don’t carry foreign DNA. BS: That seems pretty clear—a commonly used definition of GMOs is that they are organisms that have been engineered to contain genes that you wouldn’t normally find there. ZL: They did go through a GMO process in order to achieve the desired outcome. BS: How is that possible?? AA: To get CRISPR into the plants, scientists have to borrow part of the older genetic engineering process, the one that this definition of GMO is based on. That process involves using a common species of soil bacteria, called agrobacterium, which inserts foreign DNA into the plant. ZL: The beauty though is that after you target your gene using CRISPR, to create mutations or to change the DNA in interesting ways and powerful ways, you can then immediately remove, — through genetic crosses that are done through natural breeding processes, you can remove the foreign DNA that was brought in by agrobacterium. And you are left simply with a plant that no longer has the — foreign DNA that was introduced, and all you’re left with is the remaining mutation, or the scar, in the gene that you were targeting. So this is an active discussion of whether this is considered GMO or not, and I think it’s gonna be an interesting discussion to see, how it plays out worldwide, whether such and such gene-edited plants and crops are considered GMO. BS: These are the kinds of questions that individuals need to ask themselves, and why it’s so important that even non-scientists have an idea of what CRISPR can do. I’ve seen criticism from scientists about the idea for that C.R.I.S.P.R. TV show we talked about at the beginning of the episode, because they worry it won’t actually give people the knowledge they need to make informed decisions. BS: Hopefully our little show about the power of genetic information is doing its part to properly introduce CRISPR to the public. AA: And we hope you’ll help us, J. Lo. 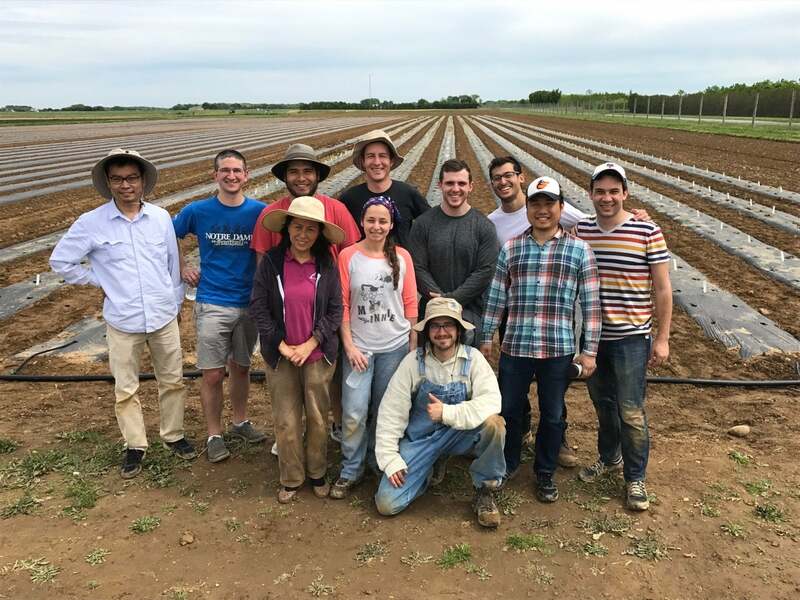 Scientists on Lippman’s team, seen in the photo below, are also farmers for part of the year. 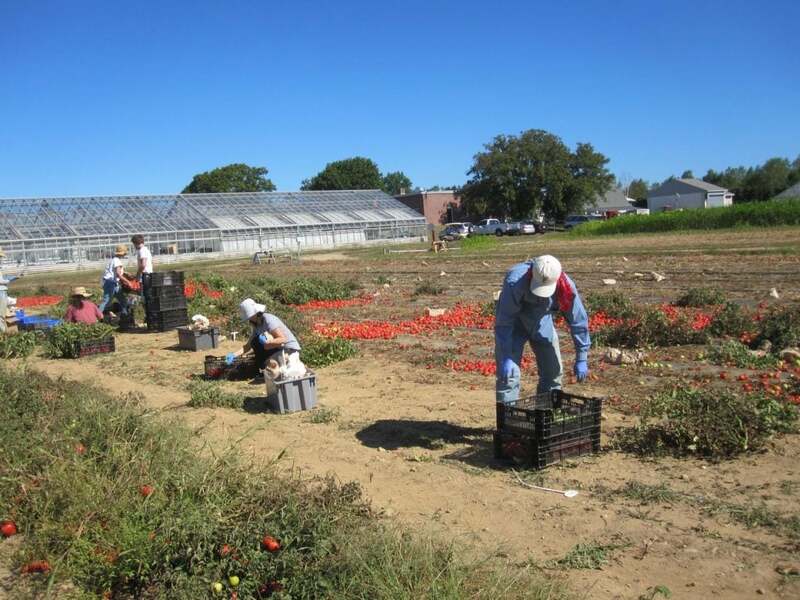 They go out to experimental fields each growing season to plant tomatoes and other crops they’re working on in the lab. Lippman and his team spend much of their time each spring and summer tending to their plants in fields and greenhouses. Using CRISPR, Lippman and his team edited the genome of tomato plants to yield tomatoes that flower and fruit weeks earlier. In our “CRISPR vs. climate change” episode, we talk with him more about how precisely editing the genes of crop plants could help us prepare for the effects of a warming climate. The new film “Food Evolution,” narrated by Neil deGrasse Tyson, shows why climate change can’t be left out of the discussion about genetic modification of our food.